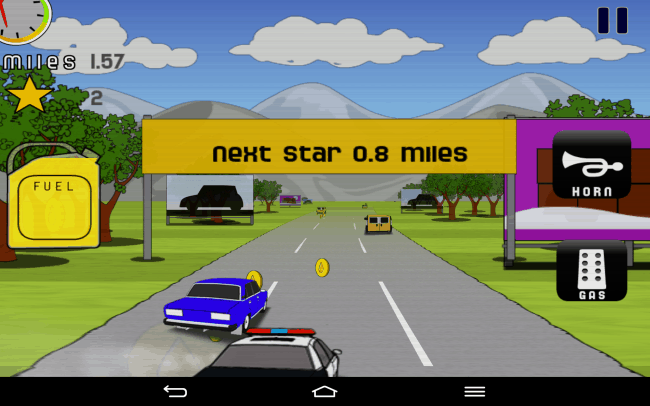 Description: Car Run is a fun Arcade game for Android that brings back memories of racing games like Out Run and Need for Speed. The aim of the game is to keep on driving for as long as you can, collecting fuel as you go, and of course avoiding the cops who are out to ruin your fun. With scanlines included to complete the nostalgic look and feel of the game, Car Run is a piece of Retro nostalgia. With tilt controls, Car Run is an arcade-style racing game that will test your reflexes and reaction times. 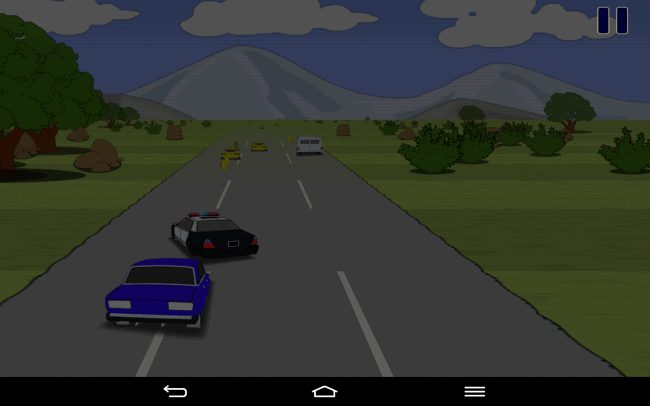 How it Works: To hit the black top and escape the cops, you need to download Car Run from the Play Store and then choose a car. To start with, you can only choose the starter car, but you’ll have to go through the tutorial first anyway. The controls are really pretty simple, all you need to do is hit the gas button to accelerate, and then use the horn to clear cars out of your way. When driving down the highway, you need to remember to collect fuel coins, or you’ll end up running out of fuel, and that’ll be the end of your run. Each time you collect a new star, you come closer to unlocking a new car to drive. Getting caught by the cops will of course end your run, so keep the pedal to the floor and avoid hitting the cops. Opinion: Car Run reminds me of arcade classics and it’s a great game that’s a lot of fun and easy to play. Definitely addictive, Car Run feels like a modern reimagining of games like Out Run and other arcade classics. The tilt controls aren’t too sensitive, so they’re nice and easy to control, but it’d be much better to get the horn on the left-hand side, as it can be quite difficult to clear cars our while trying to go as fast you can. However, that does add a decent level of challenge to the game, but the difficult controls can get in your way a little bit. Speed (4.5/5) – Car Run ran well on a number of devices and I never came across any issues. Smooth throughout Car Run lives up to being a racing game. Features (4/5) – This might be a similar game to many that we’ve played before, but it is a lot of fun and it’s a great game for those that miss those golden days of gaming. Theme (4/5) – The scanlines and colorful graphics are cool to look at, and it looks good on high resolution displays including tablets. Overall (4/5) – A nice throwback to gaming of old, Car Run is a game that anyone would like to play, but those Retro gamers will love it more than anyone else. Easy tilt controls aren’t too sensitive to control and work well. Great for those Retro gamers that remember games like Out Run and oldschool Need for Speed. 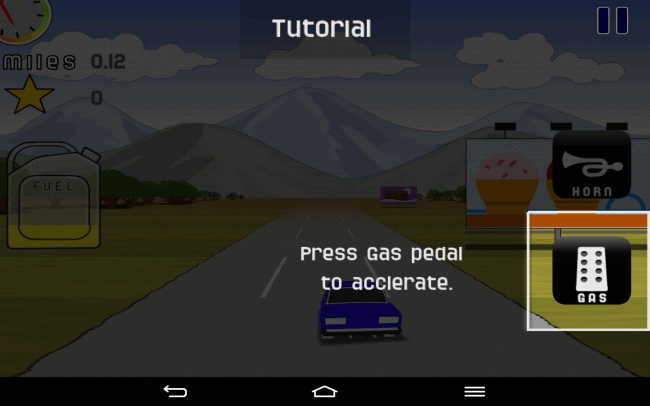 Fuel system adds a much-needed desperation to the endless runner genre. Scanlines are a really nice touch and will appeal to anyone that played old arcade games before flat panels existed. The cars could be a little more distinct and colorful. Horn would be much better on the other side of the display. Conclusion: Car Run is a fun game that will appeal to anyone that’s played Out Run or something similar and still brings to the table an identity of its own. The Retro look and feel is a nice touch and the overall gameplay is addictive and the longer you keep going for, the more of a badass you’ll feel running away from the cops. The horn icon position is a little annoying, but it’s nothing you don’t get used to and it can add a little challenge to the overall gameplay. 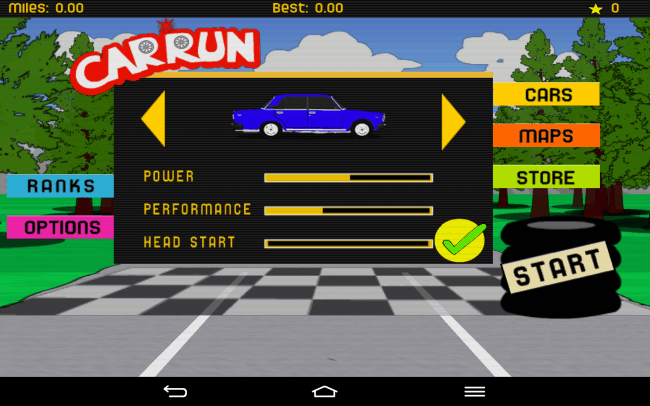 The post Sponsored Game Review: Car Run appeared first on AndroidHeadlines.com |.